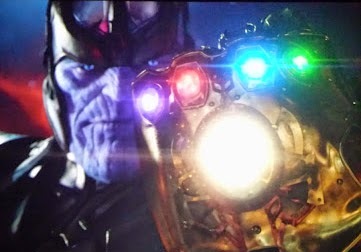 Notes and Nerds: Thanos Has The Gauntlet! We've discussed the rumors before, and it all culminates to this very one point. Avengers: Infinity War parts 1 and 2! October 28th was the date that Marvel did the ultimate fan service by holding a HUGE event for the fans, not stockholders, investors, or stuffy suits. They made announcements about big movies in the Marvel Cinematic Universe that drove the fans present, and online, absolutely nuts...this fan included! One thing that slipped my attention earlier when I wrote up the list of movies announced, there was this little tidbit about Thanos. Now, excuse the poor quality here. This video was captured by a fan that went to the event, and uploaded the trailer. In this trailer, we see every single event in the MCU that is culminating to the point in Avengers 3. We have seen bits and pieces of Thanos in Avengers, and Guardians of the Galaxy. However, Thanos is going to be a major player in the two part Infinity War. In this trailer, we also see every single major plot device from the various films. The Tesseract, Chitauri Scepter, The Aether, and "The Orb" have long been suspected to be Infinity Gems. In this trailer, we have all but been confirmed. Now...the long wait, and the gaps to fill in with each and every other movie in Phase 3 to kick off.